The Sunset Cafe was a top night-spot on Chicago’s infamous South Side. Al Capone owned it, Louis Armstrong starred there. The Sunset Cafe Stompers do play the music of that period… great tunes from Scott Joplin, Irving Berlin, Jelly Roll Morton, Duke Ellington, Fats Waller… but the band’s wide repertoire also features songs made famous by artists as diverse as Patsy Cline, Marilyn Monroe, the Inkspots, Fats Domino… even Elvis. Beneath it all, one can sense the elusive, shifting, pulse which defines the sound of New Orleans. In that city, ever since the 1900s, bands have been hired to attract a crowd or to add spirit and generate excitement for all kinds of occasion. 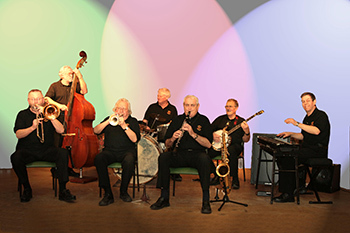 Throughout the last twenty years we have followed in that tradition: playing jazz clubs, concerts for churches, arts centres, village dances, weddings, festivals, funerals, garden parties… from our Dorset/Somerset base, down to Cornwall and up to Cumbria.